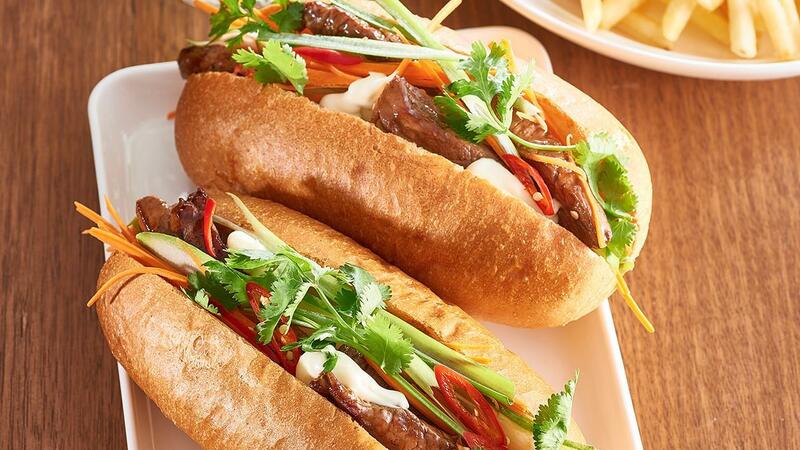 Vietnamese rolls are a flavour explosion. This roll is no exception and is perfect for your customers to eat with one hand while on the go. Pan sear the steak on both sides, add the KNORR Chinese Honey Soy Sauce GF and cook for 5 minutes or until desired liking. Rest for a few minutes then slice. Combine the HELLMANN’S Deli Mayonnaise with the KNORR Garlic Puree. Slice the rolls and fill with the sliced beef, garlic mayo and salad ingredients. Replace the salad with a slaw mixed with the HELLMANN’S Deli Mayonnaise for a true American style sandwich.